Next Thursday, Bassel Khartabil, a.k.a. Safadi will celebrate his 33rd birthday — his third in a prison cell in Damascus. 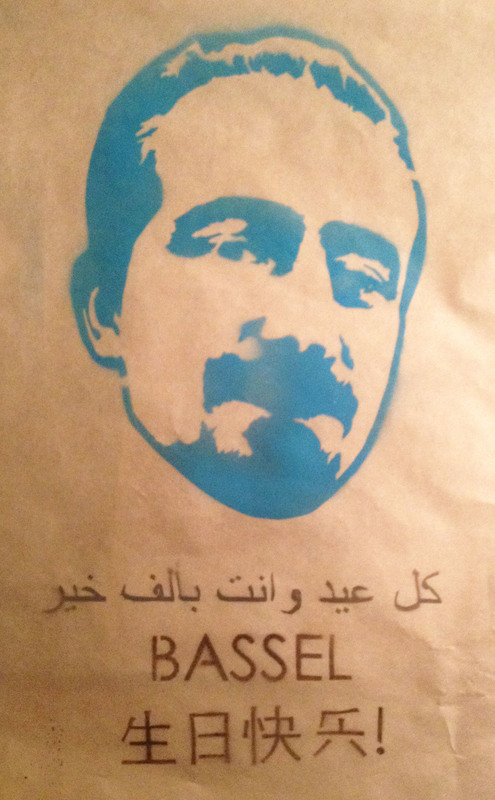 Bassel was arrested in Damascus on March 15, 2012, on the first anniversary of the Syrian uprising. Bassel was about to get married to Noura, his lawyer and future wife, whom he later wedded while in prison. Bassel is a Syrian-Palestinian computer engineer who believes strongly in the power of open network and collaboration. Before his arrest, he was a leading member of Syria’s open Internet community, promoting open source software development, open culture and supporting the creation of collaborative workspaces in Damascus. He was and remains a respected leader who inspired and facilitated the work of so many others, not only in Syria but across the region. The Syrian regime could not tolerate this. 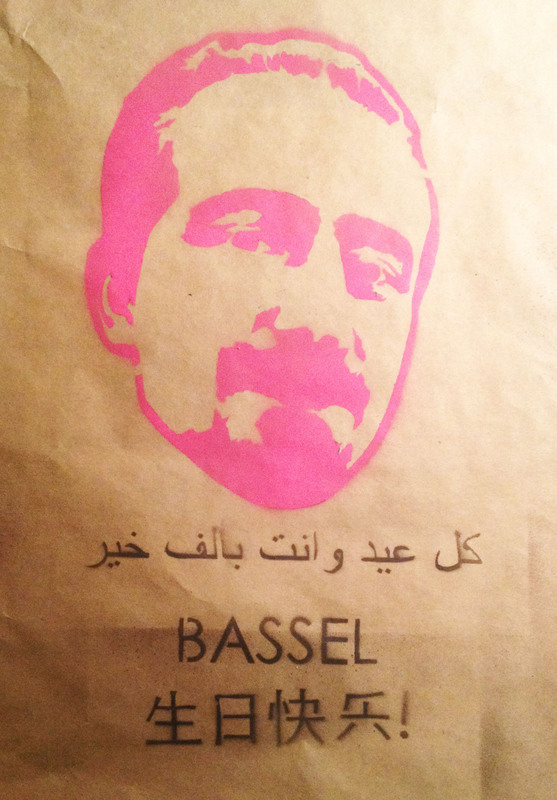 In sum, Bassel is in jail today because he is one of the brightest and most inspiring minds in his generation. Bassel is a close friend of the Global Voices community who joined the second Arab Bloggers summit in Beirut in 2009. His friends still remember him as a gentle and generous character who was great to have around and take the lead from. 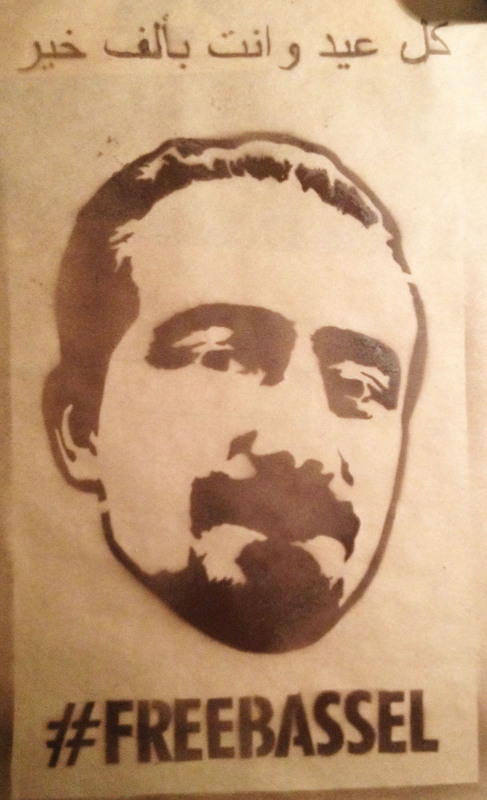 We do not want Bassel to spend his birthday, alone in his prison cell. We want him to hear our voices loud and clear and know that we are still supporting his case. 1- Participate in our Twitter marathon (Tweetathon) on May 22 from 1 PM to 4 PM GMT (click here for a time conversion). 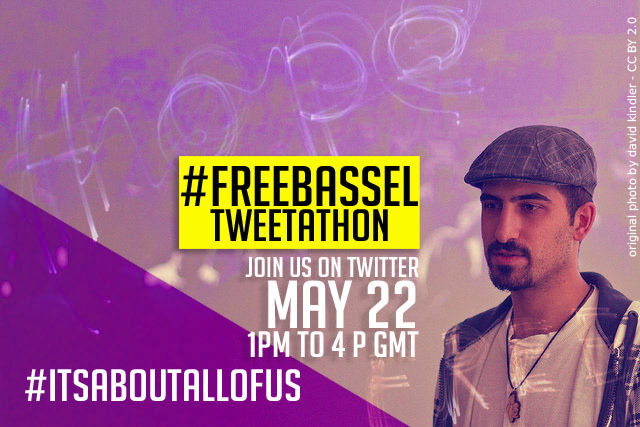 Please try to use the day’s hashtags as much as you can: #FreeBassel and #ItsAboutAllOfUs. 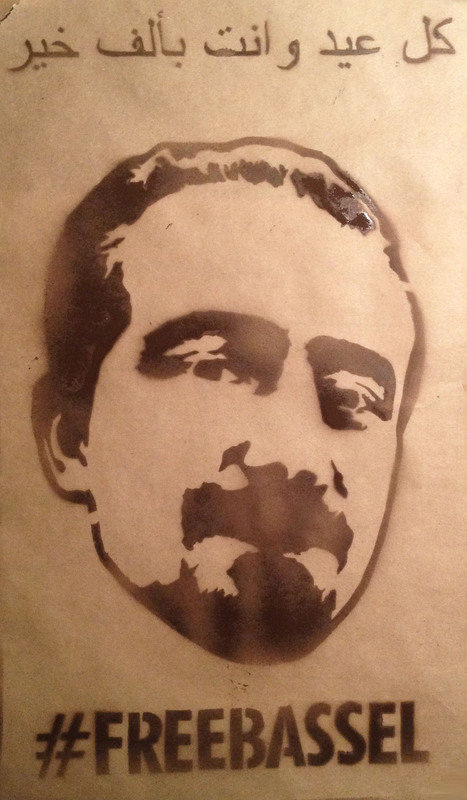 2- Submit a photo to the FreeBassel Tumblr with a message of support including either one or two of the hashtags: #FreeBassel, #ItsAboutAllOfUs. 3- Print one of these original posters by artist Kalie Taylor — hold it in your photo or post it in a public space in your city or town. thank you for your blogpost. I believe it will bring a smile on Bassel’s and Noura’s faces. I just came back from Syria and I met Noura, Bassel’s wife and we’ve had a long conversation. Noura is a very brave, warm and intelligent woman. Bassel can be very proud of her. They see each other twice a week. The Syrian government has lifted her travel ban – but she will stay in Syria and take care of Bassel and many other political prisoners for whom she volunteers. Bassel himself seems to be in OK condition regarding his physical and mental health. For now. 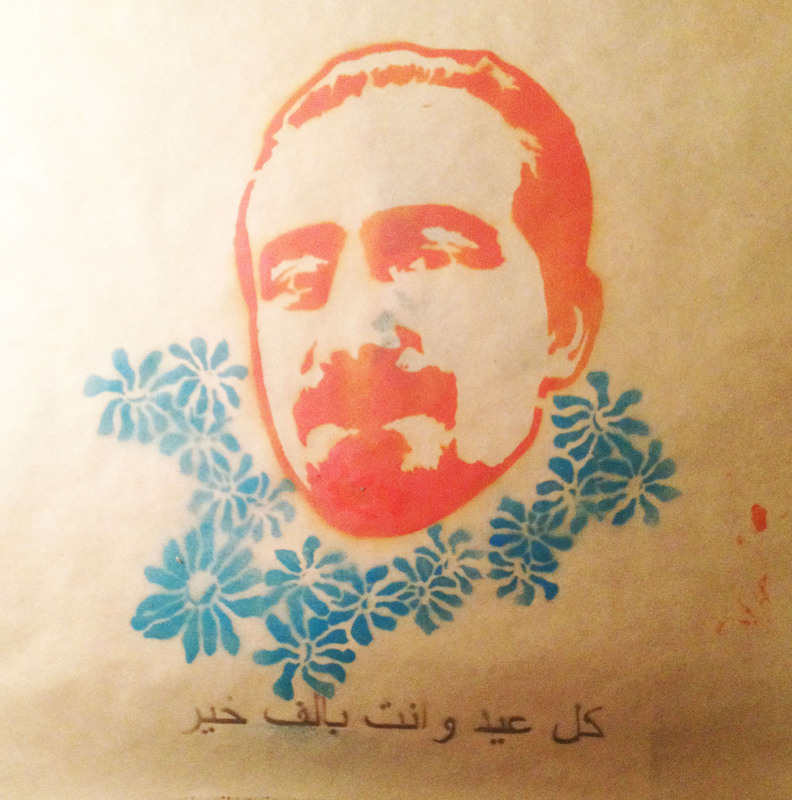 Together with Bassel there are currently 35.000 (estimated number) political prisoners in Syria’s government prisons. The prisons seem to be not necessarily controlled by government, the prison security apparatus has become an institution of its own during the war. And arbitrariness is what we see. Hardly anyone of the detained is facing a trial, many of them disappear – and no one knows where. The number of requests sent to the officials is countless, relatives very often have no idea what has happened to their loved ones. It is very, very difficult to identify those in this system who need to be addressed in order to help and in order to achieve something. This is hard and above all long lasting work. And you never know what the outcome will be. But this is THE crucial point. Without them nothing will be achieved. It can’t be done over night. And it can’t be done with campaigns who don’t reach into this system. And just imagine if they would be heard within this security system – what would be the effect? Frankly speaking – it’s hard to imagine that the effect will be a positive one for the specific person. Unfortunately. So what can we really do ? What will have a positive impact on Bassel’s situation? We were discussing this on a panel at re:publicca14 where two Bassel campaigners from San Francisco presented Bassel’s case. And I’d like to take the chance here with this audience to discuss our options … and I hope you will allow this. The most promising option from our discussion was to create a win-win-situation for all sides involved: the government, the security people, the prisoner. Imagine a delegation of “high Western officials” would travel to Syria handing over a list of prisoners’ names to government / security officials. If the prisoners would be released everyone would become GOOD PRESS … positive media awareness. Could be one way … still the question remains how to identify those who are really controlling the prison. Any ideas, comments, suggestions are welcome … ! Please start this discussion and keep up your great work. It is essential.